The Cyclone V10 cord-free vacuum cleaner is equipped with a 125,000 rpm motor and is said to operate cord-free for 60 minutes. The Pure Cool air purifiers comes with an LCD display to show real-time air quality and particulate levels. Dyson has launched some new products, which it says are the “future of clean home technology in India.” The company has launched the Dyson Cyclone V10 cord-free vacuum cleaner, which is equipped with the company's fastest motor that spins at 125,000 rpm. Dyson has also announced its Pure Cool series of air purifiers in India, with a room and a desk version. The desk version of the purifier is more portable than the standard variant. Dyson has priced the Cyclone V10 at Rs 44,900 and the standard Pure Cool air purifier costs Rs 43,990, while its Desk version is priced at Rs 36,900. Starting with the vacuum cleaner, the device is cord-free and is built around the company’s V10 motor. Dyson says that the new motor “allowed Dyson engineers to rotate the cyclones and bin assembly through 90 degrees, into an in-line configuration. The resulting linear airflow path ensured improved suction which allows you to capture the hidden dust thereby truly deep cleaning your home.” The vacuum cleaner is said to generate over 79,000G as the airflow inside the device reaches up to 190 km per hour, which helps in capturing ultrafine particles. 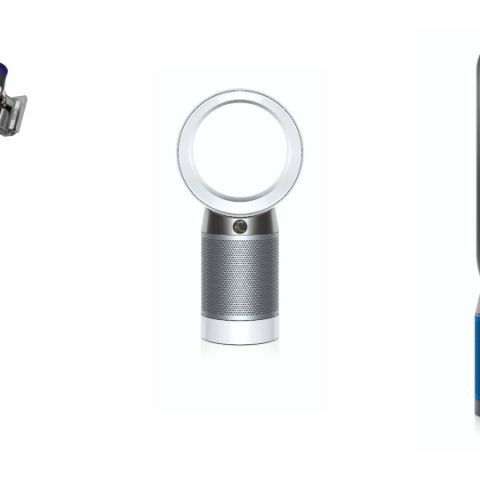 Dyson says that the device can capture 99.97% of particles, which are as small as 0.3 microns in size. It comes with a rated cord-free cleaning time of up to 60 minutes while being used on mode 1 and features two cleaning heads, one for carpets the other for hard floors. Coming to the Dyson Pure Cool Air Purifier, it looks similar to the company’s previously launched Pure Cool Link air purifier. However, there are some noticeable changes like a display on the front and revamped design. The new air purifier is equipped with an LCD display, which shows PM 2.5, PM 10, VOCs and NO2 levels inside the home by using the sensors onboard. The device features a tris-coated activated carbon filter to remove gases, and is equipped with a Glass HEPA filter that is said to capture 99.95% of microscopic particles and pollutants as small as 0.1 microns. As the air is directed to the front of the air purifier with the ‘Air Multiplier technology,’ the company has introduced a diffused airflow mode as well, using which the air can be directed away from the user. There is also a desk variant of the device, which is smaller and more portable. The air purifiers comes in Iron/Blue and White/ Silver colour variants. Sir James Dyson, Chief Engineer and Founder of Dyson, said, "A strong performing machine starts with an efficient motor. The Dyson digital motor V10 is Dyson’s most advanced. It has enabled us to entirely change the format of a vacuum cleaner, and to achieve Dyson’s best ever cord-free machine performance. The Dyson Cyclone V10 vacuum is so light, so powerful, it can deep clean anywhere in your home, across various surfaces and floor types." The launched devices will be available from Dyson Demo stores in DLF Promenade, Select City Walk in New Delhi and VR Mall in Bangalore. Online, one can purchase them Dyson’s official website and Amazon.